Sleepace RestOn Review: Easy Setup & Usage But How Accurate? 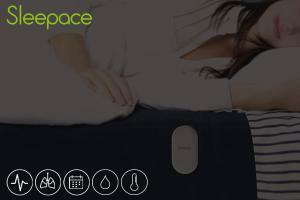 Sleepace RestOn Review: Is It an Accurate Sleep Consultant? The Sleepace RestOn Z400 comes with new features, but the question still remains: is it a reliable gadget to monitor sleep? There are many types of sleep trackers out there, but it can be hard to figure out which one works the best or is the most accurate product available. There may also be questions about what will be a good fit for someone who is busy and does not have a lot of time to figure out setup, or how to actually use a device like this. In this article, we will talk about what is so special about this sleep monitor, as well as how to set it up, and what it measures. After reading it, you should know if you want to try a Reston Z400, or need to search elsewhere. The Z400T sleep tracker has slightly different features than the Z200. For example, it measures humidity and temperature, where the other did not. Also the sensor band is a little longer than the Z200, which covers a wider area to lay on. Besides this, there is little difference, as far as specifications go, although the Z400 may be able to give you better personalized advice since it monitors the room conditions. Another thing that makes it different from the earlier version is that it is white and gray instead of solid black. This color might allow it to blend in better on a bed, so it’s more out of sight and out of mind. The RestOn Z400 is a non-wearable smart sleep monitor that is intended to fit between the sheet and the mattress and provide a plethora of information about sleeping habits and patterns. The RestOn Sleep Monitor is a device made up of a long strip, which resembles a seat belt that is placed between your mattress and your sheet. The machine itself looks like a sleek flat computer mouse and connects to the belt via a magnet. It has an LED light to let you know when it is on. It weighs less than half a pound and is around 35 inches in length. It’s white and gray in color. The sensor belt is not noticeable at all and more comfortable than wearing a sleep wristband. The tracker itself doesn’t interfere with the sleeping process but you have to keep an eye on the belt since the sensor band may slide off under the sheet and need to be re-positioned to prevent any loss of data tracking. It is compatible with Apple and Android devices and has a battery life that lasts around a month. When the battery is dead, it can charge in about 2 hours, which is quite fast. The LED indicator will switch from red to green, in order to alert you that the battery is fully charged. There is no guesswork involved. You can use 2 Sleepace RestOn units when two people share the bed, but keep in mind that if you want to get an accurate reading, each one should lay upon the side of the bed where his thin fabric strap is positioned. The setup of the product is straightforward, but you have to know what you need to do in order to start tracking relevant information that can help you. The first step involves taking the machine off of the belt and placing the belt underneath the sheet. Next, the belt must be at the level where the chest is when it’s laying down. If you place it higher or lower, it is unlikely to work correctly. After that, the sheet can be put back down, and the machine goes on top of the sheet. It will snap into place since the magnet is powerful enough to work through the bedding. The app is necessary for the setup process since it won’t track results without the app. Download the RestOn app from the relevant app store, depending on the type of phone you have. An account is required, so a few details will have to be entered the first time you run it. You must connect the product to a phone via Bluetooth to turn it on the first time. This lets it know to start tracking your sleep cycles (light, moderate and deep periods) and everything else it does. After the machine connects, there’s no need to keep the app open. This is one of features I like about this product. Once you've completed the setup process you don’t need to keep the phone turned on to monitor your sleep quality. You can recheck it sometime after you wake up. Still, the app is needed to turn off the monitoring as well. This may be a way to remind users to turn it on and off, as it does not happen automatically. It is something that is manual, but that is a good thing since it shouldn’t be tracking a bed that isn’t being used. It will take a little time to get some of the statistics to show up. There isn’t anything wrong with the machine or the app; that is simply the way it’s designed. At the same time, other stats will show up right away. The respiratory and heart rates should be available in real time. 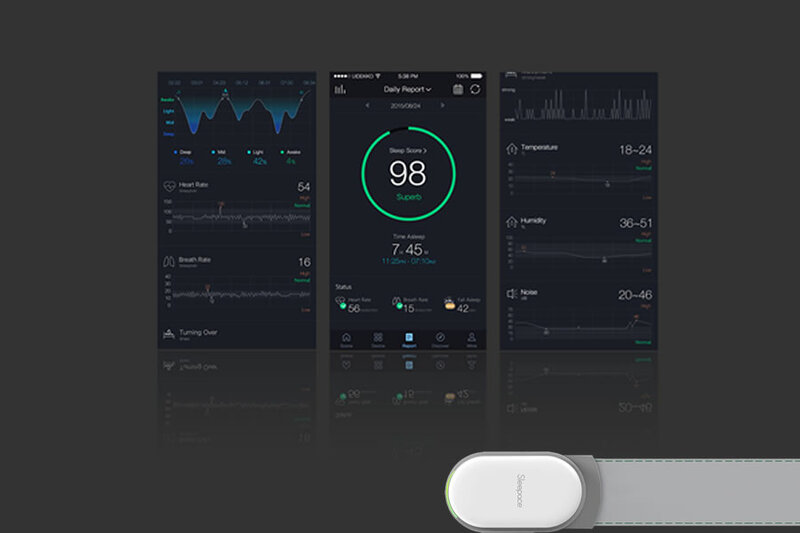 RestOn smart sleep tracker one measures heart rates, respiratory rate, sleep cycles (except REM sleep stage), temperature, and humidity. All of these things are important when it comes to sleeping, but you may not think about them when you have trouble resting. I personally can’t sleep when I get too hot and need a certain amount of humidity, to breathe well while I’m sleeping. The body tends to dry out a bit throughout the night, which can be a factor in overall sleep tendencies. Here’s a quick look at some of the major features. This gadget measures a handful of things, which can offer a wide view of what’s going on when someone is asleep. It can track sleep statistics every night without syncing to Sleepace App for up to 6 months. It calculates tosses and turns, when the bed has been left, as well as other things that can come in handy. After the app and machine start to track your statistics, you can view them. The app takes all the information it learns about sleeping habits and offers a sleep score to show how good or bad a sleeper a person is. This is based on a variety of things, like the number of times tossing or turning occurs, and can change as data is updated. The RestOn app is connected to a family cloud account. This allows you to be able to share all the details with your family, and see what is going on with others. You can compare and contrast your numbers, and see who sleeps the best. The Sleepace App provides coaching support. After data tracking starts, the statistics are calculated within the app, you get a better picture of how you sleep. Changes can be viewed, and every day you will get a number that tells if you slept well or not. When a night sleep was poor, or the app seems that something is amiss, it can provide tips for exercising and diet, as well as other things, which may improve future nights of sleep. There are other options out there, very similar in setup and usage to Sleepace RestOn. 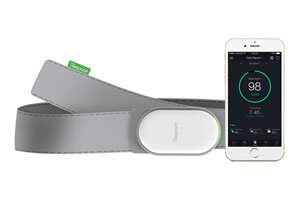 For instance, the Withings Sleep device has a pad that you lay on, instead of a flat belt. It tracks some of the same things like heart rate, sleep stages. It doesn’t measure breath rate, temperature or humidity but has a snore detection system. Another similar product, Beddit has all the features of Sleepace Reston but has a shorter belt and doesn’t have as powerful a battery as RestOn model does. Unfortunately, I can’t recommend Beddit as an alternative since the cloud service for Beddit has been shut down recently, and future of the product is not certain. Sleepace is a company that knows what it’s like to be unable to sleep and how that can affect your personal and professional life. The founders suffered from these things themselves. They opted to change that and are now considered an innovative brand when it comes to making products that can help people sleep. The RestOn was their first product, and they now have an array of items that you can check out and purchase. These include the Nox, which is a smart night light that can help lull you to sleep, and the Sleep Dot, which is a different type of sleep tracking monitor, in the non-wearable category. The RestOn was once featured on the crowdfunding site, Indiegogo, where it very much exceeded the funding it was requesting. This led to the product being produced and the second generation is now being made, which is the Z400. The previous model was the Z200. I appreciate that the machine is so easy to set up and use. It will only take a few minutes, and you’re ready to start logging your sleep data. As long as you place the band in the proper place and pair a phone, there’s not much else to worry about. Of course, you will need an Android device that is 4.3 or later or an Apple product that runs iOS7 or later. The phone doesn’t have to be right beside you since it will be able to communicate with the unit up to 33 feet away. It is designed to be used in any type of bed, so even when a partner is sleeping right next to you, it shouldn’t have any problems collecting sleep related data. You can use the RestOn tracker with another smart device NOX wake up light. There is a chance that it may have future capabilities to work well with other products like Nox Aroma Smart Light, Nox Music Smart Light, Sleep Dot that are made by Sleepace, so if you are already a fan of their products, this may be interesting to hear and a major selling point. The App has a smart alarm feature, where it wakes you up while you are in a light sleep stage. You can combine this alarm clock with Nox Music to wake up naturally with soothing sounds and light. The major downside is that you have to turn it on and off manually, so you must remember this if you want it to work properly and track numbers each day. The long-lasting battery is a major pro since it won’t be running out of juice constantly. There have been no comparative sleep studies or medical analysis experiments performed on this device, so there’s no way to prove scientifically whether or not it can help someone sleep better. This also means there is no easy way to determine if it is more accurate than other products in its class. Although there is no perfect sleep monitoring device as of yet and the Z400 is a slight step up from the Z200, looking at the customer complaints about accuracy it is hard to recommend Z400 to anyone at this moment. If you are looking for a non-wearable alternative with a similar type of setup and usage, check out the Withings Sleep(Nokia Sleep) which has a more affordable price tag. Or you may consider one of the activity trackers that comes with sleep tracking features such as Fitbit Versa, Fitbit Charge 2, FitBit Alta HR or Fitbit Ionic.